Well, I was able to complete the card for the challenge over at 2sketches4you this week. I was able to spend a few minutes here and there it in the small moments that I had while Hannah was sleeping. 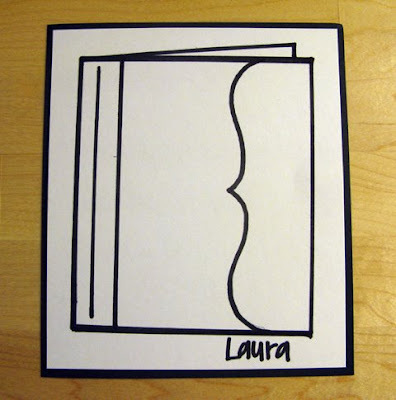 I used a frosted card blank from this week's sponsor ShortCuts on the 2sketches4you website this week. 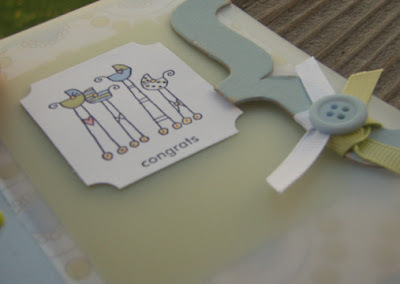 The cardstock, ribbon, and stamps are Stampin Up. The brads and paint on the chipboard piece are Making Memories. The patterned paper and button are from my scraps and I don't know what the brand are. I colored in the stamped image with my Stampin Up markers. Amy, this card is totally adorable! I love, love, love it. Great job! Congrats on your little one she is beautiful!! Very lovely card. Love this kind of transparent. Really lovely card. Those strollers are adorable! Congrats on the beautiful little baby girl! 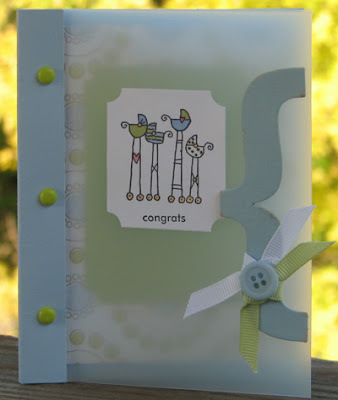 Love the baby carriage stamp you used! Amy, this is adorable like everything you do. Love it! Oh my sweetness....I love, love, love this adorable card!